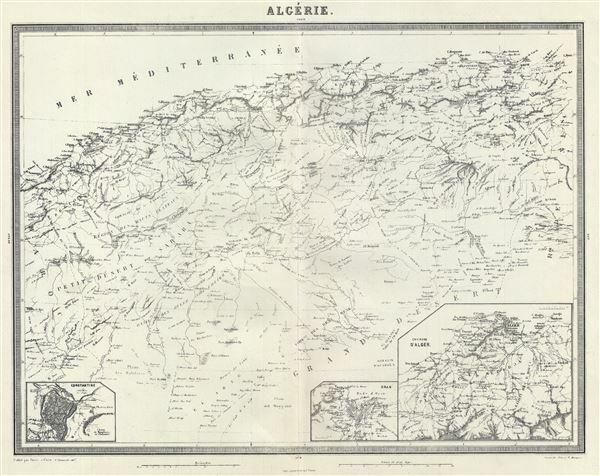 This is a fine 1874 map of Algeria by Ambroise Tardieu. It covers the French colony of Algeria on the Barbary Coast of Africa. After its conquest by the French in 1830, Algeria became an attractive destination for European immigrants. However the majority indigenous Muslim population was dissatisfied with the political system. This dissatisfaction would ultimately trigger the Algerian War and lead to Algeria's independence from France. An inset of Constantine is included in the lower left quadrant of the map. The lower right quadrant features two more insets of Oran and the Environs of Alger. This map also identifies various cities, towns, rivers and an assortment of additional topographical details. This map was prepared by Ambroise Tardieu and issued in his 1874 edition of Atlas Universel de Geographie Ancienne et Moderne. Very good. Minor wear along original centerfold. Original platemark visible. Minor spotting. Print faded.